Rheingold spends chapter 5 of Net Smart detailing how important it is to build a network with people and why these networks matter. As he likes to say, “We have always lived in a world dominated by networks, from our brain cells to social ties,” (Pg. 191). It is crazy to think I could be connected to someone in India because I know people who know people who know people etc, for example. It is the 6 degrees of seperation, which was touched on in the book. The importance of networking is huge because it can determine if you get a job or not. A lot of jobs hire a person because that person knew somebody else. This is the network I came up with for my teaching career. My network is really small at the moment because I just started taking classes for my major. I think my biggest connection is my dad. He is a teacher as well. He has taught at a few places in Cherokee County and he coached football at my high school. 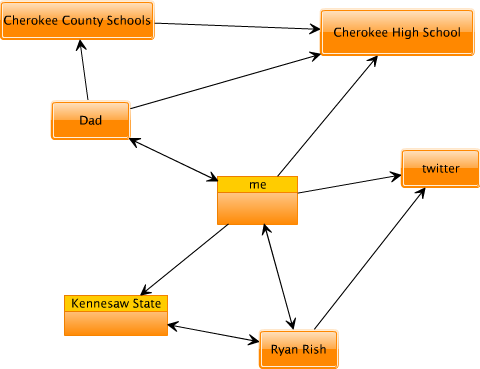 So, my dad has a lot of connections. Plus, he still has a lot of connections in other parts of Georgia. Hopefully as I continue on my journey to becoming a teacher, I will gain more connections and my network will grow.